General Chukwuemeka Odumegwu-Ojukwu died on November 26, 2011—and, with him died a small piece of my history. Ojukwu couldn’t have known it, but he is partly responsible for the person I am today. The General and I go all the way back. As a young Igbo military officer, Ojukwu was the governor of the Eastern Nigeria province where I was born and spent the first years of my life. In 1966, while I was a baby living with my family in a secure oil company compound, the rest of the country was plunged into turmoil by a series of coups and counter-coups among military factions. They culminated in vicious pogroms against Igbo officers (like Ojukwu) and civilians in the north of the country—genocidal atrocities that have been movingly evoked in Chimamanda Ngozi Adichie’s novel Half of a Yellow Sun. In the spring of 1967, after talks with the government failed to reassure Ojukwu that the Igbo people were safe in a federal Nigeria, he declared the eastern region independent from the rest of the country. This new state included the Igbo tribal lands—and, significantly, most of the country’s oil reserves. 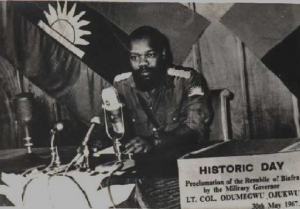 In a stroke, Ojukwu kicked off the bloody conflict that became known to the world as the Biafran War. Very soon after, like the McCall family in my novel The Possibility of Lions, we were forced to leave Nigeria as the country mobilized for war. We left with only a few hours’ notice, taking practically nothing with us. We assumed we would return one day—Nigeria was the only home we had—but we never did. The war raged on until 1970, by which time we’d settled permanently, but not happily, back in America. As a small child, I felt like someone had stolen my home from me and I resented it very much. It’s no exaggeration to say I’ve had my eye on Ojukwu ever since. I watched the man first in black and white, on the television in our living room in Bakersfield. The Biafran War was the first ever to be televised in the kind of detail we take for granted today and there was plenty of opportunity to study him. Ojukwu always wore a uniform and sported a trademark beard that made the baby-faced young officer look older, tougher, more like a rebel. Later, these images of Ojukwu in command were replaced by those of fleeing villagers and starving children. These were the images that were destined to become our lasting cultural memory of Biafra. 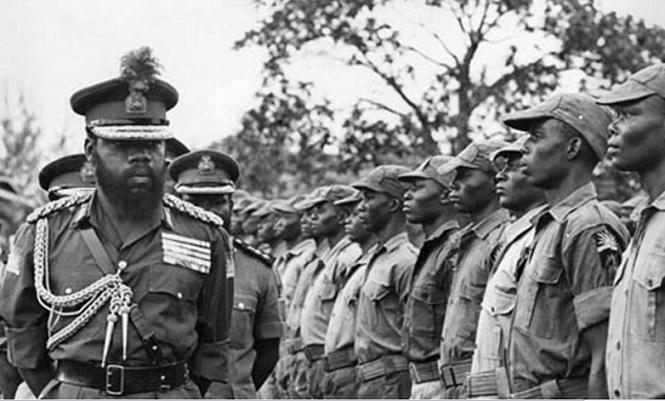 Ojukwu survived his civil war, catching the last plane out as federal troops swept in. Others weren’t so lucky. As many as three million people may have died over the course of the war, killed off by a combination of hunger, disease and violence. The ex-leader settled into exile in Ivory Coast and for awhile he disappeared from view. But I didn’t forget him. Far away in the US, I nurtured my Ojukwu obsession. In the days before the internet, I kept him in my sights as best I could, tracking him through the archives of newspapers and film, stalking him via historical accounts of the war, memoirs and biographies like Frederick Forsyth’s Emeka. Eventually, I moved to London, a place that’s long been a second home to wealthy Nigerians. Here I found traces of Ojukwu everywhere I went: down the road at the boy’s school he attended in Epsom; at Oxford, where he partied rather than studied; at Sandhurst, where he learned the military tactics he put to use, with such mixed results, in Biafra. What was my thing about Ojukwu? At the start, I blamed him for what had happened to us. I thought he was responsible for our exile (as I saw it). I wanted to observe the fate of a man who had so carelessly shattered my life and the lives of countless others with his botched war of secession. And what about Yakubu Gowon, the Nigerian head of state on the other side of the war? It takes two (at least) to perform the bloody tango of a civil conflict. Why didn’t I fix on him the way I did on Ojukwu? In fact I did track Gowon, though not with the relentlessness I brought to my surveillance of Ojukwu. He ruled, leading an increasingly corrupt military administration, until he was overthrown by a coup in 1975. Then he did a PhD in political science at Warwick University in the UK and started a nonprofit bearing his own name. He lives on still. His post-power life has lacked all glamor, and maybe that’s partly why he’s failed to hold my interest. With Ojukwu, it was always personal. Doubtless, I was watching him hoping for the chance to see him suffer. Later, when I understood more about the causes of the conflict, I stopped holding Ojukwu solely responsible. Eventually I came to see him as a man of the moment, an opportunist, rather than a true catalyst. It was the moment, not the man, that I really needed to understand. It was an important breakthrough in my understanding of how history works. Ojukwu simply embodied that moment for me. Nobel Laureate Wole Soyinka: Still with us, thank heavens. So I didn’t really mind when, 1982, the Nigerian government pardoned him. He returned home at last, married the former Most Beautiful Girl in Nigeria (official) and resumed life as a public figure, but in a more low-key way. In a country that remains volatile and divided, Ojukwu settled right in and essentially became part of the establishment. At Brown University in 2010 he sat down to talk about the war with Chinua Achebe, author of Things Fall Apart, and Noble Prize winner Wole Soyinka. As for Ojukwu, when asked if he had any regrets about the war, he said no. Blind by this time and monosyllabic, said that, given the opportunity, he’d do exactly the same again. Well, what would he say? Now he is dead. He ended his life not far from where I’m sitting as I write this, in a London hospital where he no doubt received the best care money can buy. He will never know me, never know that I was keeping tabs on him all these years. But if he did know, it probably wouldn’t surprise him. Ojukwu loved attention. He believed in his own myth. He’d think my fascination with him was natural, only what a great man deserves. I watched the tributes to him come pouring in in the days following his death. In the background I heard the low, mechanical hum of history being rewritten. The burial ceremony for Chukwuemeka Odumegwu-Ojukwu took place in Enugu, Nigeria on Feb 2 2012. For more on his life, see the Guardian or the Economist obituaries. For more on my Nigerian novel, The Possibility of Lions.